The queen of flowers – with a beautiful combination of colours and textures. Perfect for bowls, flower arrangements, goblets. At the window, on the sideboard, table and on a buffet table. Versatile ornament. For every season and every occasion. You can conjure up the most beautiful, artistic arrangements in no time – just like the pros. An arrangement of real, natural roses as luxuriantly and densely packed with flowers would cost significantly more – especially in the colder seasons. 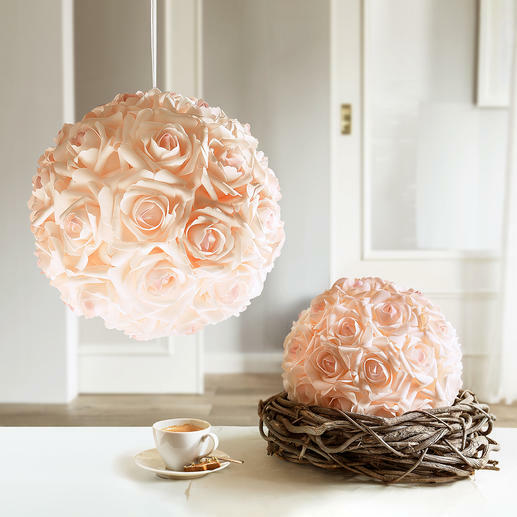 With these rose balls you can have fine floral decorations in the house all year round – without spending a small fortune. And without the need for elaborate care. 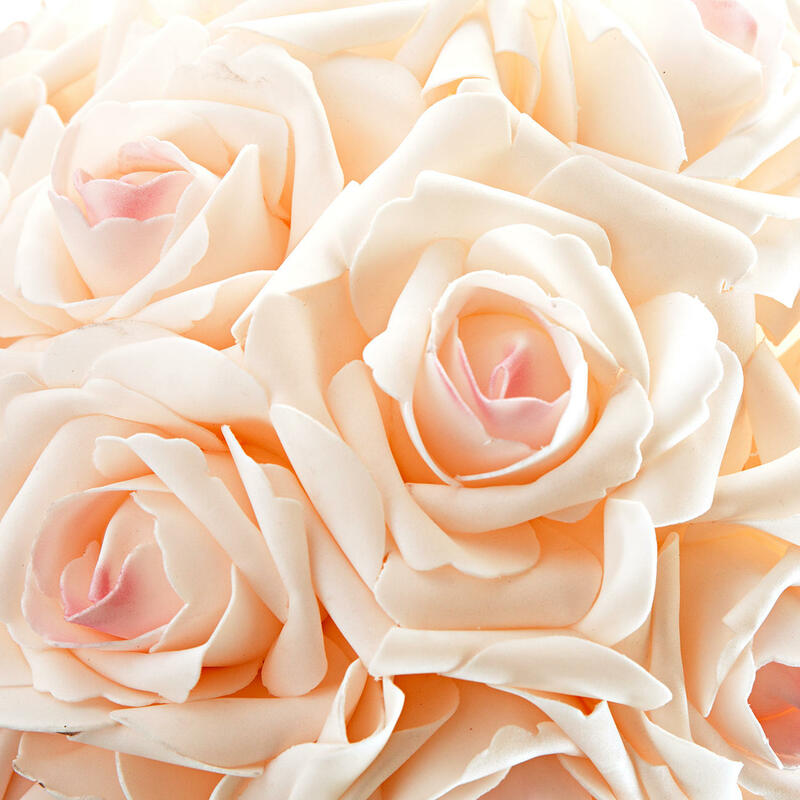 Creamy white on the outside and delicate shades of pink on the inside, the roses look particularly elegant and natural – but not too simple and not too twee. A special foam gives the flowers a velvety texture and a gentle volume. The individual petals are shaped true to nature: Densely packed in the middle of the flower and softly furled towards the edges. The flowers look as though they were cut in their prime of growth. The smaller ball is also ideal for the centre of a wreath made from fir, twigs or chromed metal. The large rose ball looks very elegant as an eye-catcher placed on the floor next to the sofa. Or as a festive rose ball tree, with a stem and ribbon in a flower pot. Also, they’re really effective when attached to a trellis for a wedding, christening, anniversary, birthday, etc. The flowers are firmly fixed. To clean, just blow the dust off with a hairdryer (cold air mode). The smaller version has 40 roses, each with a diameter of 6-7cm (2.4"-2.8"). It measures 28cm (11") in diameter and weighs approx. 170g (6 oz). The large ball measures 38cm (15") in diameter, weighs approx. 310g (10.9 oz) and has 40 roses, each with a diameter of 8-10cm (3.1"-3.9"). Ribbon for hanging included.